FORT BRAGG, N.C. (9/16/2011) – For the second time in seven months, a valor ceremony took place to recognize the heroism of soldiers from Fort Bragg's 3rd Special Forces Group (Airborne). 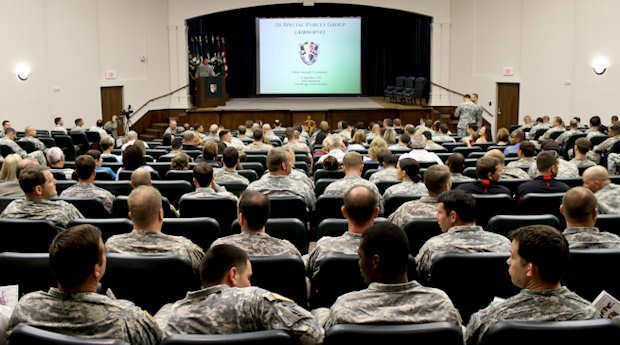 Thirty soldiers from the group were honored Sept. 15 at the JFK Special Warfare Center and School here, as commander of United States Army Special Operations Command, Lt. Gen. John F. Mulholland Jr., awarded two Silver Stars, seven Bronze Stars with “V” device, 10 Army Commendation Medals with “V” device and 11 Purple Hearts. The ceremony showcased vignettes of the respective actions of the two Silver Star recipients, Capt. Matthew L. Golsteyn and Sgt. 1st Class Chad E. Lawson. Each soldier braved enemy fire for hours; exposing themselves to danger in order to help their fellow service members and Afghan counterparts. Golsteyn was awarded for his actions on Feb. 20, 2010, in Helmand province, Afghanistan. Lawson was recognized for his actions on Aug. 4, 2010, in Kandahar province, Afghanistan. Also receiving awards from the battle that garnered Lawson his Silver Star were Staff Sgt. Robert Bradford (Bronze Star with “V” and Purple Heart), Sgt. 1st Class Sean King (Purple Heart) and Staff Sgt. John Bear (Purple Heart). The USASOC commander acknowledged the selfless and humble nature of the Special Forces soldier as he addressed the crowd of family members, friends and fellow service members. “One thing that every one of these guys would say, I'm sure if you asked them, is I was just doing my job,” Mulholland said. He went on to say that it was his “extraordinary honor and privilege” to recognize the soldiers.